and sometimes you just get lucky! Last June a seemingly homemade pedal came up for auction on ebay. The seller had no idea of its origin or even what it sounded like, since he couldn't get it to work. 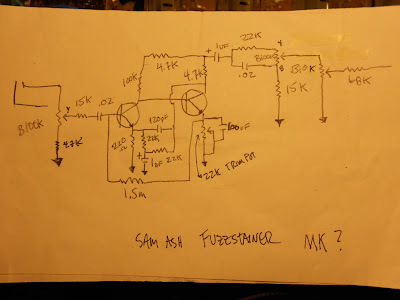 I did not recognize the circuit but could tell it was old and that it was possibly a fuzz. I figured "what the hell?" and went for it. 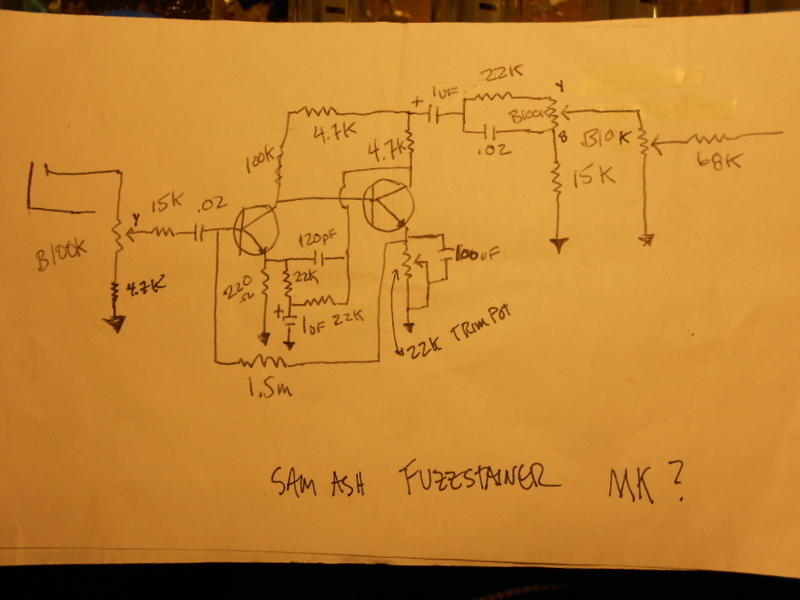 Worst case scenario, it was something like a home-project Fuzz Face that I could raid for parts; best case, it was some rare and previously unknown circuit I could nab for a really low price and easily fix. So I end up winning the auction, and the wait was on. Finally the pedal arrived and I decided to troubleshoot all of the obvious stuff first. I changed the battery, and that did nothing. I checked all of the solder connections and they seemed fine. Finally I decided to plug the guitar cable into the output jack and the amp cable into the input and ZZZAP!!! It worked! It sounded really cool but what was it? 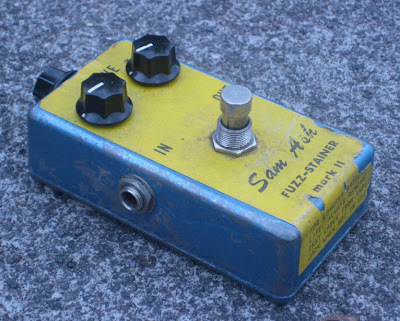 I ended up sending a few gut pics and a description to Bart(discofreq) and he linked me to the Sam Ash Fuzz-Stainer. Up to that point only 1 had surfaced and the owner was being very careful not to give away the magic hiding inside. 1- The overall gating effect is the same. 2- There is an internal trimpot that controls the amount of gating. 4- The Tone stack sounds identical in both pedals. 5- The Enclosure of the pedals. 6- The reversed Input and Output jacks. 7- Even the wires used are exactly the same in both! Also upon closer inspection it is obvious that the pedal was originally the same color Blue as the one in the photo. If you look at the pictures of mine, around the switch and on the inside case you can clearly see the blue paint jumping out at you. In fact, a couple of small paint chips came off and underneath the red was again, that same blue found on the original. All of this detective work leads me to believe that it has to be nothing BUT a Sam Ash Fuzz-Stainer. I assume that its from the early 70s, but I really have no idea. Most of the components are pretty old and it uses the same brand of footswitch that was in the Sam Ash Fuzzz Boxx and Astro Amp Astrotone, but I still don't believe these were from the 60s like those. I wish I knew the history of this pedal actually, because it almost has this feel of being a project kit that Sam Ash sold in some of their stores. Or the other alternative that makes more sense, is that it was sold in only one Sam Ash location and was built by an employee. Which would be the reason why so few got out into the world and only 2 are known to exist today??? So what does it sound like!?! you ask. Well if you were here a little while back you may have seen this video I posted of my buddy Jerms doing a quick demo of the Fuzz-Stainer. I had sent it to him for a little R&D and he made a really nice clone; like dead on (except the trimpot for the Gating was moved to the front of the pedal for more control). There are some things you may not have picked up from that video. For one, the Tone Stack is amazing. Not only is it completely usable through its entire rotation but on one end it can mimic other fuzzes like an Maestro FZ-1a or a Fuzzrite, while on the other end it sounds like a Fuzz Face, or more accurately a Vox Distortion Booster V8162. This is definitely one that I have a hard time not plugging into on a daily basis and it will most likely stick with me for quite a while. The Sam Ash Fuzz-Stainer is a unique one, and the reason I still look for weird pedals everywhere, all the time! So keep hunting my friends. *Update; here is the schematic thanks to Jerms!